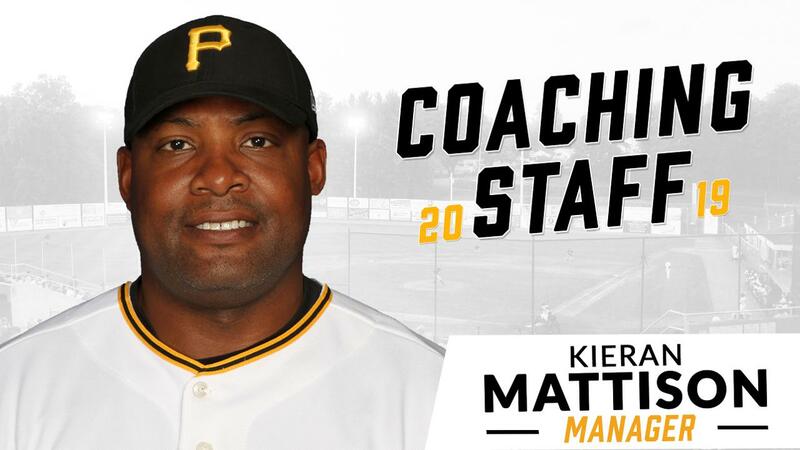 The Bristol Pirates will have a completely new field staff for 2019, as the Pittsburgh Pirates have announced Kieran Mattison as Bristol's new manager. Mattison will lead the 2019 team with assistance from pitching coach Eric Minshall and hitting coach Jonathan Prieto. Mattison and Prieto served in the same positions for the West Virginia Black Bears in 2018, while Minshall joins the Pirates organization after spending the last six seasons as the pitching coach for the Miami University Hamilton Harriers. Matt McNamee will also join Bristol's staff as the team's athletic trainer. Mattison pitched for nine seasons combined in the minors and in independent leagues from 2002-2010, where he compiled a career 39-22 record over 548 1/3 innings. After his time as head coach of the French Baseball National Team in 2013, Mattison spent 2016 as a coach with the GCL Pirates before being named the DSL Pirates manager in 2017 and the Black Bears manager in 2018. Prieto played for four seasons as a second baseman in the Pirates system from 1998 to 2001. Over 322 career games, Prieto hit .249 with three home runs, 100 RBI and 61 stolen bases. As a member of the Lynchburg Hillcats in 2000, Prieto led Carolina League second basemen with 77 double plays turned. Prieto has been a coach in the Pirates' system since 2010, spending time with the VSL Pirates, DSL Pirates and Jamestown Jammers before serving as the Black Bears' hitting coach for the last four seasons. Minshall will spend his first year in the Pirates organization as the pitching coach for Bristol. A native of Ohio, Minshall joins the organization after 20 years of coaching throughout the Midwest. He has spent the past five seasons as the pitching coach for Miami University Hamilton in Hamilton, Ohio. Minshall has helped lead the Harriers to 170 wins, an overall team ERA of 4.15 during his time at the college and three-straight Ohio Regional Campus Conference titles from 2016 to 2018. After spending the last two seasons as Bristol's manager, Miguel Perez has been named manager of the Greensboro Grasshoppers in their first season as a Pittsburgh affiliate. Tyler Brooks, the 2018 Appalachian League Athletic Trainer of the Year, will spend this season as the athletic trainer for the Black Bears. Austin McClune has not been assigned to a team in the Pirates system for 2019.